Yep, doesn't surprise me at all. I like this one a bit more than the fully cloaked Klingon Bird of Prey. Also have 0 interest in it. Pffft, just trying to milk the cow again. I said this before somewhere else, but I wonder if they have to at least put one thing out each year to keep their license. At this point the only thing they are putting out is one SDCC exclusive each year, kind of seems like it's just a way to keep it going in the most minimal way.. Doesn't seem unreasonable. 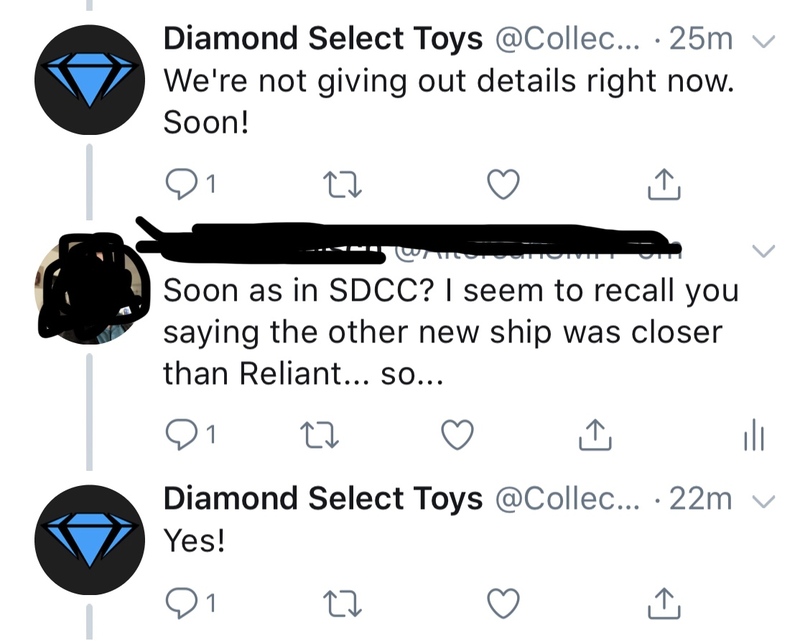 It's probably the Enterprise A that hasn't been released yet and the next two SDCC variant exclusives..
DST usually means new ships when they say new ships, so I don't think he means variants. Maybe they do actually have 3 in development, doesn't mean they'll ever see the light of day, or if they do, it won't be anytime even remotely soon. Yeah true, also "in development" really means nothing at all, could just be an idea. I need one! Who is going to SDCC?? As variants go this Bird fo Prey seems perfectly appropriate. At least it's not "JUNGLE CAMO ATTACK ROMULAN BIRD OF PREY!" Dont spoil next years exclusive like that. Scheduled release date? 2053. Unless there are "factory delays". Nah, you got it wrong. That's when we'll see a picture of the first ship that's now coming out before the Reliant. The only ship I can think of is the Excelsior and Enterprise B, but those have been done. Two new designs that are close enough to be considered variants, but different enough to be considered 2 separate ships. After talking with Will Decker about what could be variants of the same ship that require two new designs.... There is really only one answer.... The D7 and the KTinga! Those came to mind, but can't almost all of their differences be done with paint apps? The sculpts themselves aren't that different, not to the same extent of the B and Excelsior. Two alien ships in a row would also be surprising, and hasn't DST said they aren't going to do the D7/K'Tinga? I don't know, it could very well be them since I can't come up with any other ships that'd fit that description, and they make sense. Will Decker is a big fan of the D7 and KTinga.... He told me there are major differences in the two designs.... I really think that might be the two we are getting.... Plus all the variants they could make with both designs. This would be amazing, but probably too good to be true.